I coined the term moments ago to refer to dressing to approximate the formalness of the dinner jacket and matching trousers — a.k.a. “black tie,” or the tuxedo. If you have any plans at all for New Year’s Eve, and don’t have a dinner jacket, consider something approaching the formality of err.. formal dress. Regardless of the dress code. Actually, what we consider to be “formal” was, when it was introduced, considered “semi-formal” dress. Togs to change into after a day in pursuit of the fox (or whatever) without resorting to the boiled shirt and white tie of pater’s generation. Formal meant a tailcoat. Nowadays, “formal” means a tuxedo, or dinner suit. If Hollywood has its way, it will come to mean, donning long trousers cut with only four pockets out of some material other than denim or khaki and perhaps a shirt that doesn’t pull-on. If you’ve been reading my blog, you know my penchant for evening clothes and tailored clothes in general. I firmly believe that if you are over the age of 21, you should own your own dinner jacket and have it tailored to suit you. Shawl collar or peak lapel, preferred. If you can’t afford new, I suggest buying vintage at half to a third the price and have your tailor fit it to you. But, for argument’s sake, let’s say that you haven’t time to spare and must attend a more formal affair. What to do? Imitation is the sincerest form of flattery. Learn the lessons of black tie and apply them to your evening’s dress. Your shoes should be black, cap or plain toed oxfords, polished until they gleam. Your socks will match the color of your trousers. Pair your suit with one of two choices of ties: the “matching” color in a solid grenadine weave (Navy with Navy, Black with Black, Silver Grey with Charcoal. Ben Silver makes some nice ones), or the “wedding” tie. Wedding ties are silver based and very smart looking. You may wear a discreet pattern with this choice, perhaps a glen plaid. Cary Grant chose a particular shade of silver-blue to wear with his charcoal suits. Tie a four-in-hand or a half-windsor knot, which are more devil-may-care, since the rest of your look will be very studied. Your tie should rest on an immaculate plain, white, spread collar (or straight collar or cutaway– anything but a button-down) shirt with double (French) cuffs. Choose silver or gold cuff-links. If they are inherited or vintage, great. And remember to make sure that everything fits well. Show some shirt cuff at least a 1/4″ if not a 1/2″. You’ll stand head and shoulders above anyone who rented…. Make it a New Year’s Resolution that you will keep: look as good as you can as often as possible. 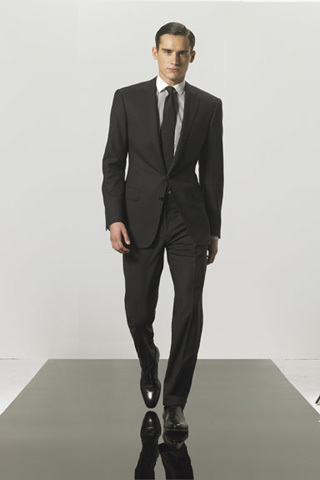 This entry was posted in Elegantology and tagged black tie, dinner suit, dressing, Elegantology, tailored clothing. Bookmark the permalink.